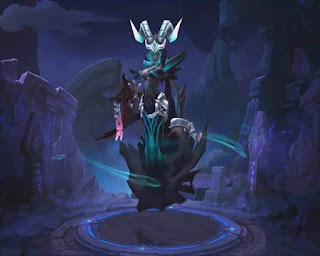 Here comes another hero from Mobile Legends called Vexana the Necromancer. She seems to be more powerful based on her skills and ability’s description. By looking at her in the video below, you may see some Moskov like appearance in a girl version. The ultimate of Vexana can resurrect enemy heroes that help her during clash for a number of seconds. That sounds amazing right? She can generate allies out of the cursed enemy and fight with the surrounding targets dealing percent of plague damage. We don’t have any details on what it the role of Vexana but our wild guess says she can be a Mage/Support hero. If you have ideas in mind do tell us by hitting the comment box below. For those who are excited to know about the price, skill, and abilities of this hero, do check out the details below as your reference. Passive – Necromancy Spell: Adds an occult spell to targets who take damage from the Necromancer. While the spell lasts, the target will explode upon death, dealing X magic damage to surrounding units. Units who receive plague damage from puppets will also have Necromancer spell cast on them. Skill 1 – Charmed Specter: Unleashes ghostly power in a forward direction dealing X magic damage. The first hero hit will lose control and move towards the Necromancer. Skill 2 – Nether Snare: Summons an other-worldly power to deal X magic damage to a specified location. Skill 3 – Cursed Oath: Puts a curse on enemy heroes, which deals magic damage, and causes the targets to receive X magic damage per second. If a target dies while under the curse, the target will resurrect and become the Necromancer's puppet, fighting for the Necromancer. A resurrected puppet will release plague to surrounding targets, dealing magic damage to them. Since she is a new hero, you can set default Vexana build to continuous magic power damage, then experiment on the items that can make you comfortable using this hero. You use Arcane boots if you prefer magic penetration along with the movement speed use go for 10% cool down reduction.